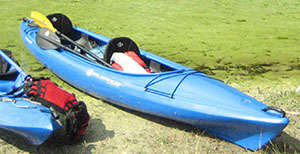 We use a variety of modern recreational and touring kayaks for all of our tours. Since we operate year-around, the majority of our kayaks are the sit-inside type to keep you as dry as possible on those cool days. For our photography tours, and for those who want to paddle with a friend, we use tandem kayaks that seat 2 people comfortably. 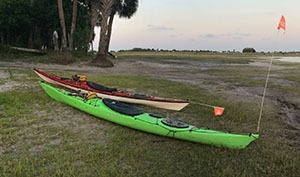 Our kayaks are extremely stable and perfectly suited for the Florida creeks and rivers that we tour in. Most have front and rear storage compartments to keep any gear dry and out of the way. And since we have a variety of different types and brands, you can try different ones out to see what you like best. All of our equipment is cleaned and inspected daily, so you never have to worry about your safety or wearing some stinky old life jacket that hasn't been washed since the stone age. Some of the brands we use include: Wilderness Systems, Necky, Venture, Current Designs, and Perception. All of the equipment is provided on our kayak camping tours and expeditions. That includes: tent, sleeping pad and bag, pillow, headlamp, camp stove, fuel and food (usually Mountain House dehydrated meals), and a chair. 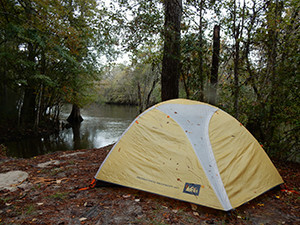 The camping equipment that we use is the same that is offered by major outdoor retailers like REI. So once you've learned how to kayak camp like a pro with Adventure Kayak Florida, you can head to the store and buy your own gear with confidence.